“I’ve been a good little worker bee, I deserve a gold star,” sings Justin Pierre on the opening track of “My Dinosaur Life.” You know what? He’s right. In an era where you can watch more music videos of unknown bands on YouTube than you can see mainstream artists on MTV, VH1 and Fuse combined, the major label debut album doesn’t have as much significance as it once did. However, Motion City Soundtrack has succeeded in putting out a debut album that people should pay attention to. Produced by Blink182’s Mark Hoppus, My Dinosaur Life takes you on a trip back to the days when pop punk was great and Emo was still characterized by clever, expressive lyrics over hard hitting guitar riffs. Listening to this album made me feel like I was back in high school, only instead of teenage angst Motion City Soundtrack now reflects the self doubt of adulthood. With lyrics like “a total calamity, the choices I have made,” on the song “Hysteria,” this album is an honest confession of everything the band’s been through. From beginning to end, this album soars. It has high energy fueled by nonstop melodies, catchy hooks, honest yet ironic lyrics, and vulnerable vocals. It does have a bit of the polished feeling of a major label record, but the slickness works in their favor. 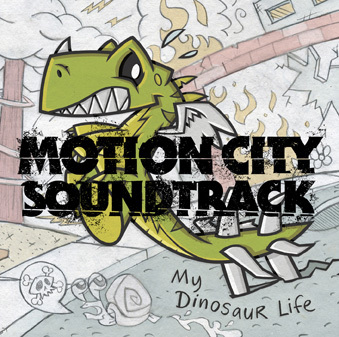 “My Dinosaur Life” is a fusion of the best moments of Motion City’s last three albums combined, and it is without a doubt their best release to date. Although the album has an overall theme of growing up and leaving the past behind you, every song is unique and very different. From the Ben Folds-esque “Skin & Bones” to “Pulp Fiction,” the (better) reincarnated ghost of Eve 6’s “Inside Out” or the radio friendly, ϋber poppy “Stand Too Close,” there is something for everyone on this album. It’s really admirable to see a band growing musically without losing what made them special to begin with. Motion City Soundtrack is evolving, but they aren’t alienating their fan base in the process, and that’s what I love about this album the most. While they will probably never be totally mainstream, “My Dinosaur Life” is a ferocious major label debut, and it doesn’t look like they will “Disappear” anytime soon.